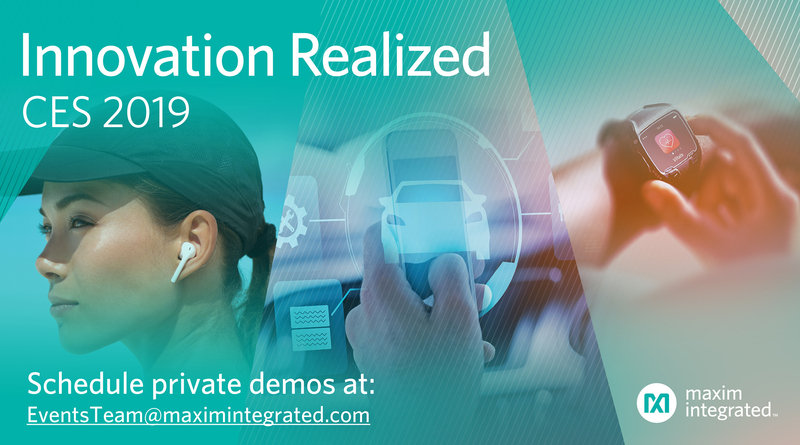 MUNICH, Germany, and LAS VEGAS, Nevada/USA – December 12, 2018 – At the 2019 International Consumer Electronics Show (CES) in Las Vegas, January 8-11, Maxim Integrated Products, Inc. (NASDAQ: MXIM) will showcase its latest analog and mixed-signal technologies that are enabling an array of applications, such as smarter, safer cars, accurate wearable healthcare devices and mobile audio products with rich sound. To request a meeting with Maxim in our private suite at the Sands Expo Conference and Convention Center, email EventsTeam@maximintegrated.com. For more information about Maxim's presence at CES, visit http://bit.ly/Maxim_CES2019.